There was a lunch yesterday. 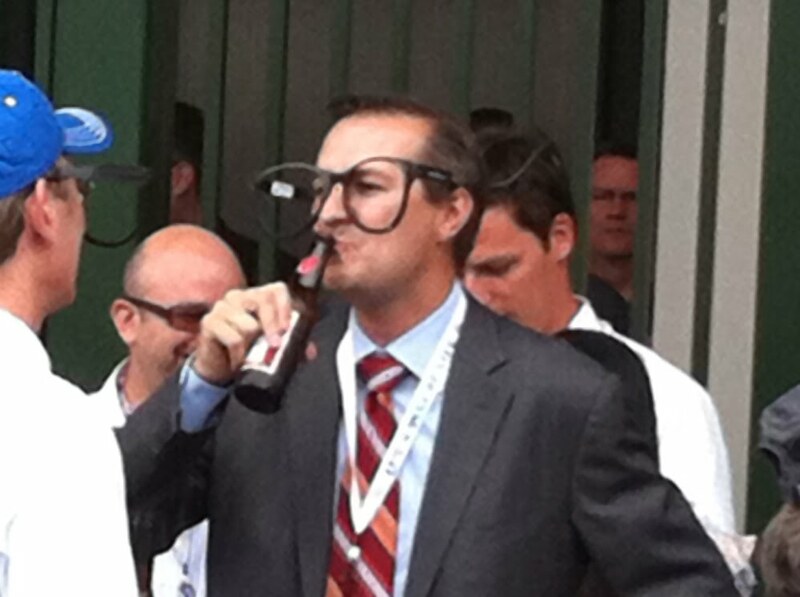 At that lunch, Tom Ricketts talked into an open microphone and pleased the fans who "get it." "We have to have a manager who really understands ... the scrutiny you get and (must) be able to handle those periods in June when you lose three games in a row and people start talking about Year 103 of the curse," Ricketts said. "We have to someone who understands what they're getting into." Ricketts also said the team has to have a manager who's "still engaged in being a coach" and is willing to teach fundamentals. "We're going to have a younger team going forward," Ricketts said. There are two bits here. The first, if taken at face value, is that Tom Ricketts thinks the Cubs need a manager who understands curses. If that's what Tom thinks makes for a good Cubs manager, then this team is screwed. Now, perhaps what he meant is that the manager needs to know that some fans and media dopes are going to start asking "Year 103" questions and that the new manager must have a thick enough skin to ignore such inanity. If that's what Tom meant, he both spoke poorly and is also correct. But for those fans thinking that 2011 would be a quick turn around, the second bit threw hope into cold storage. Going young is a polite way of saying "cheap." That also has implications for the managerial search. You don't need an expensive guy to let the kids play and distinguish themselves on the field. You need a manager who will fill out a lineup card and teach. You don't need a Point C guy like Phil Jackson. You need the Point A to B guy. Mike will do anything for the job, and, given he won't have any other offers, he'll be cheap. The second is important both in terms of cash flow and in terms of firing him when 2011 goes in the crapper (as Andy Dolan has already projected). Besides. The manager is irrelevant so long as Jim Hendry is the GM. If Ricketts really wants to fix this what he should do is this: Make Jim Hendry the manager and get a new GM who will fire Hendry after 2011. Hendry's already under contract and he's been a coach of young players before (at Creighton). This would work. To bad the Ricketts have shown themselves to be family owners more Mike McCaskeyish than Rocky Wirtzish. New Years, no matter what calendar you follow, is a time to reflect back and look forward. On the lunar calendar, that time also coincides with the end of the baseball season. Looking back and looking forward at the Cubs only yields one thought: Disappointment. While the thinking Cubs fans out there saw 2010 as a transitional year with likely minimal success on the field, none of us saw it going this poorly. Moreover, those who saw a poor season coming certainly hoped that trade chips like Derrek Lee and Ted Lilly might yield some stuff of real value. Even that didn't happen. So, the record was poor and the Cubs didn't really reload for the future. But there was still reason all fans could have hope for the future. The reason for that hope was the new ownership of the Ricketts family. Tribune ownership was only ever interested in upstreaming profits from the Cubs to the consolidated income statement and ensuring WGN TV and radio had hundreds of hours of programming. Perhaps a billionaire family would be less interested in cash flow and more interested in showing off their shinny new yacht. Perhaps they might even think of winning a race with that yacht. Yeah, we were disappointed in 2010, but we saw that coming. 2011 is going to be better, right? Even the Ricketts themselves knew this. Their first marketing campaign, "Year One," even tried to separate themselves from the previous 101 years of failure. They knew they needed to change things. That's where fans could have hope. So far, they've not only changed nothing, but they've become buffoons in the process. The ownership changed hands on October 30, 2009. To date, there have been no front office changes of the ownership's choosing (Lou Piniella was smart enough to quit on his own). What has there been? - Statues. With more to come! A few days ago, two of the Ricketts early cheerleaders, Terry Boers and Dan Bernstein, went off on the Ricketts for nearly an hour (you can hear the whole thing here). They were spot on with one exception. They, for some reason, had a lot of confidence that the Ricketts knew what they were doing. Why they would have confidence in a family that has never owned a sports franchise, they have never explained. That confidence is certainly out the window now. And there's disappointment ahead as far as anyone can see.